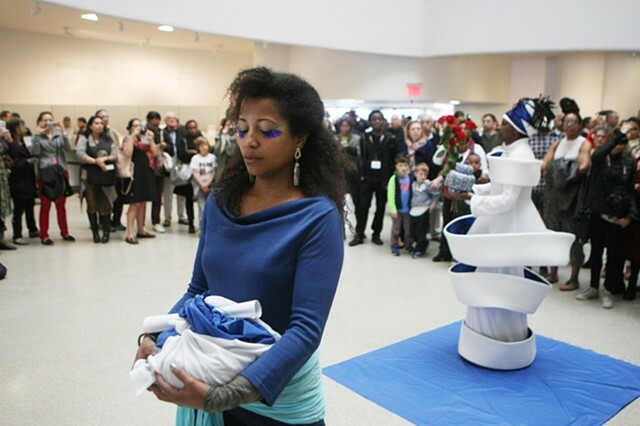 In April, I was asked by the amazing María Magdalena Campos-Pons, whose oeuvre explores themes of history, race, gender, memory, and the formation of identity, to participate in her historic performance, "Habla La Madre," at the Guggenheim Museum. This stunning procession comprised of artists, poets and musicians was part of the series "Carrie Mae Weems LIVE: Past Tense/Future Perfect" which took place during the weekend of April 25-27 at the Guggenheim Museum. The Afro-Cuban inspired intervention, conceived and performed in collaboration with composer Neil Leonard, invoked the Yoruba orisha Yemaya, goddess of the sea and fierce protector of children, while leading a packed house of museum-goers through the museum and up to the exhibition "Carrie Mae Weems: Three Decades of Photography and Video."